It’s time for lunch, and you’re starving. Where are you going to go? Thankfully, in the Center City area of Philadelphia there are a lot of choices — some of which have more healthy options than others. Here, our guide to some of the best options for a healthy lunch near Center City for the perfect midday pick-me-up. While Real Food has also branded itself as a breakfast spot, you’re going to want to stop by here around lunchtime. 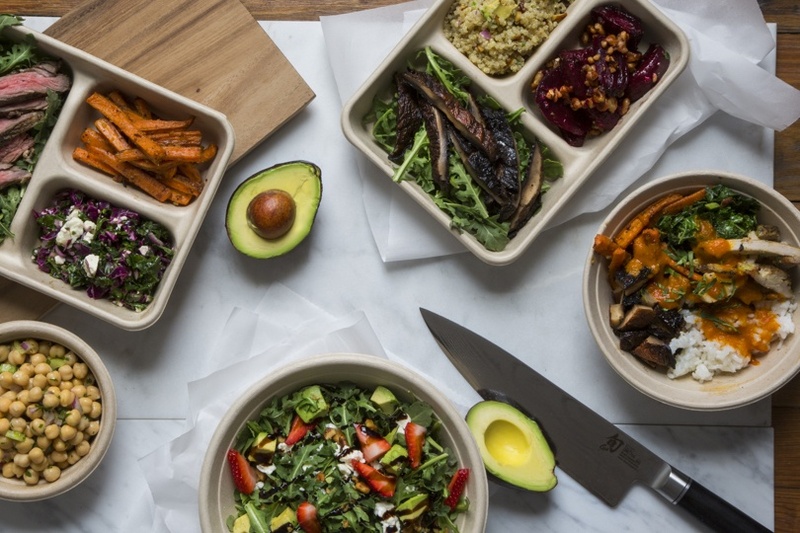 This build-your-own-bowl restaurant is focused on getting you to “eat real food” is a good alternative when the Sweetgreen line is impossibly long — and the place even has its own Harvest Bowl ($8.75). It runs a little cheaper than your average salad joint: a Umami Kale Bowl (with shredded kale, brown rice, parmesan roasted broccoli, mushrooms, walnuts, and sesame sauce) is just $7. It now has two locations in the Center City area. Billing itself as “Philadelphia’s healthy kitchen,” Fuel offers a more well-rounded menu for the just-can’t-decide eater. From paninis to açaí bowls, grilled skewered shrimp ($8.95) to sweet potato risotto rice bowls ($9.95), Fuel’s menu stays under $10. It’s also sprinkled with vegan options and gluten-free wraps. For those trying to power up for the next workout, Fuel notes the protein content of each item. Their most protein-rich meal is the Fuel Thanksgiving wrap (turkey, goat cheese, cranberry sauce, spinach, and green apples) — which, at $9.95, gives you 62 grams of protein. That’s what we like to call a deal. Two words: banana whip. The famous chocolate chip-dusted frozen banana swirl is its own argument to eat dessert first. If you’re going for a more balanced lunch, though, HipCityVeg has a variety of all-vegan options. Try their Curry Tofu Wrap for $10.25, or their Udon Noodle Salad, also for $10.25. This grab-and-go eatery offers its own meal plans: weekly subscriptions of what it calls “healthy comfort food” that you can get delivered or pick up. You can customize each plan based on what your goal is, whether you’re aiming to cut carbs or up protein. There’s even a vegetarian option. If you’re just going there to grab a meal, though, choose from salads, soups, or lunches with a twist — like the Bison Quinoa Hash ($12.99) or the “Grilled Kale Hoppin’ John” ($6.99). Pure Fare calls itself “the hardware store for your health.” What that actually means is that healthy grab-and-go lunch options, including a variety of vegan and dairy free meals, are available at this Rittenhouse spot. While its more nourishing options, like the Kale and Ricotta Frittata ($5.50) and Vegan Taco Salad ($9.95), make for a solid mid-day pick-me-up, its fruit and veggie-based desserts (like the sweet potato brownie or avocado chocolate chip cookie, both for $3.50) make for a sweet treat. If you like control over your orders, Honeygrow is an ideal lunch spot. The menu is focused around salads, stir-fry bowls, and honey-drizzled fruit cups, so there’s a little something for everyone. Try the White Bean Tuna Salad ($11) for a hearty dose of protein and Omega-3s or the Sesame Garlic stir-fry ($10.75) if you’re craving something warm. Of course, no healthy lunch list is complete without the ever growing chain that is Sweetgreen. With three locations near Center City, the BYO salad craze is spreading — and for a good reason. Most meals here are around $10, and the bowls are filling and packed with colorful veggies. Go for the Guacamole Greens ($10.45) if you love avocado, the Hummus Tahina ($10.80) if you’re meat-free, or the Fish Taco ($11.80) for something warm. This fast-casual Korean joint uses natural ingredients to create veggie-packed delights, like its staple, bibimbop. You can get a “cold bowl” for $9.50, or cough up an extra $2 to make it “sizzling.” Opt for the Giwa Original (cabbage, carrot, bean sprout, greens, broccoli) or the fittingly-named Sansom Street (romaine, bean sprout, cucumber, tomato). If you can brave the line (and summon enough willpower to march past Beiler’s), Reading Terminal actually has its fair amount of healthy spots. Try the salads at Molly Malloy’s (most run around $10 to $12), the veggie platters at Kamal’s (also around $10), or the Greek Rustic Salad ($8.75) at Olympic Gyro.